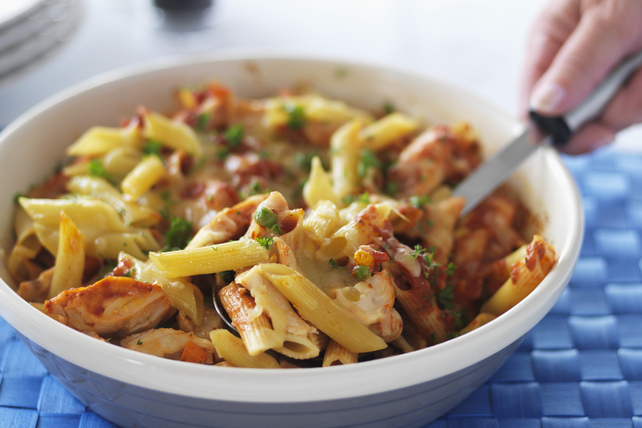 Our delicious Easy Cheesy Italian Pasta Skillet with Chicken is the perfect dish to serve on a busy weeknight. Made with CLASSICO Pasta Sauce and shredded rotisserie chicken, this comforting, cheesy pasta is sure to become a new family pasta-night favourite. Cook pasta as directed on package, omitting salt. About 5 min. before pasta is done, cook pasta sauce and chicken in Dutch oven or large deep skillet on medium heat until heated through, stirring frequently. Drain pasta. Add to pasta sauce mixture; mix lightly. Remove from heat.